Even though this wine bar is practically on the traffic hub of Shepherds Bush green and in the shadow of the mega Westfield Shopping Centre it still has a hidden quality to it. Walk past in a hurry and you'll miss. Unlike the noisy Defectors Weld opposite, the Albertine doesn't feel the need to shout about their business. Instead, they've been quietly serving crate loads of delicious bottles of vino to a dedicated following for over 20 years. They've resisted the urge to tart up the place, preferring battered wooden seats and church pews tucked under rickety old tables. The place has bags of character, helped by the laid back staff and the owner/chef's choice of cheeses and pates to go with your glass of Burgundy. It's all too easy to follow one bottle with another making this a great date place. Albertine Wine Bar clubs, bars, cabaret nights, casinos and interesting nightlife. What are the best dining options near Albertine Wine Bar London? 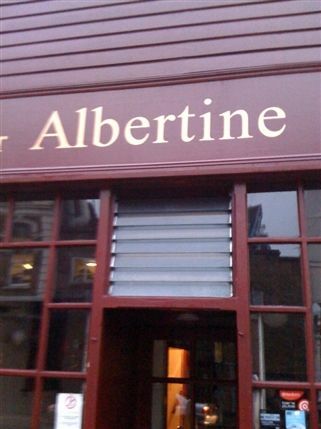 Albertine Wine Bar gyms, sporting activities, health & beauty and fitness. The best pubs near London Albertine Wine Bar. Where to have your meeting, conference, exhibition, private dining or training course near Albertine Wine Bar. From cheap budget places to stay to luxury 5 star suites see our discounts for Albertine Wine Bar hotels, including K West Hotel & Spa London from 91% off.